Manufactured by us in compliance with the set industrial norms and guidelines, quality of the offered range of Stainless Steel Fasteners for Textile Industry is never compromised. It is used for the purpose of commendable fastening of various mechanical parts n the textile industry. Marked at a market leading rate, its preference is quite high. We are considered to be a market leading manufacturer and supplier of premium quality Stainless Steel Fasteners for Textile Industry. For the purpose of living up to this reputation, we engage in using the finest raw materials and modern machinery. 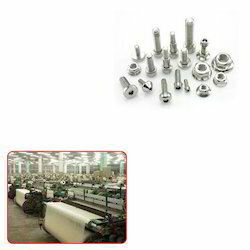 Looking for Stainless Steel Fasteners for Textile Industry ?